Nigeria is very close to achieving self-sufficiency in rice, says Lai Mohammed – Royal Times of Nigeria. 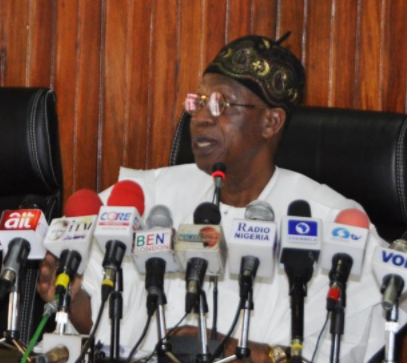 Minister of Information and Culture, Lai Mohammed, says that Nigeria is very close to attaining self-sufficiency in rice production. According to him, the administration of President Buhari has drastically cut rice importation and moved Nigeria very close to achieving self-sufficiency in rice, a major staple food in the country, in just two years. Addressing a press conference in Abuja, the Minister – quoting figures from the Thailand Rice Exporters Association – said rice importation from Thailand, which supplies the bulk of the parboiled rice being imported into Nigeria, dropped from 644,131 Metric Tonnes to about 21,000 MT between September 2015 and September 2017. He said, ”We are happy to tell Nigerians of a giant stride made by the Administration in the agriculture sector, specifically rice production: Nigeria is inching closer to achieving self-sufficiency in rice, due to the success recorded by the Administration in the local production of rice,”. Mohammed said that as a result of the administration’s success in local production, some investors from Thailand have even shown interest in establishing rice milling plants in Nigeria, a development he said would further boost rice production in Nigeria. He said, ”A few years ago, this (Thai investors establishing rice mills in Nigeria) would not have been possible since Nigeria was not considered a top rice producing country. Today, Nigeria is one of the largest producers of rice,”. The Minister said the increase in rice production across the country did not happen by accident but was largely due to the Anchor Borrowers’ Programme, initiated by President Muhammadu Buhari to support farmers through inputs distribution and loans to boost rice production, and the Presidential Fertilizer Initiative, among others. He said the increased rice production has, in turn, led to the establishment of rice mills, including the 120,000MT WACOT Mill in Kebbi and the 1,000,000MT Dangote Rice Mill. Alhaji Mohammed said with the administration targetting rice production of 7 million MT by 2018, the country was closer than ever to achieving self-sufficiency in rice, going by the fact that as at 2015, rice demand in the country was 6.3 million MT. He said the increased production was bound to force down the price of locally-produced rice and provide succor to Nigerians.